Facebook photos are now much bigger and way better than earlier. Facebook today rolled out its latest photo viewer with Google+ like features. (It) seems like the testing that FB was doing in the month of Jan 2012 with 3 modules has finally yielded something that again positions FB as a keen learner of Google+ movements. Since the launch in 2005, Facebook Photo platform has been through tremendous changes. Way back in 2007, there were 1.7 billion user uploaded photos, 60+ million photos were added every week and 100,000+ images were served per second during the peak traffic hours. By 2009, the number of user uploaded photo was approximately 60 billion (and slightly more), 220+ million photos were updated every week and 550,000+ images were served per second during the peak traffic hours. By the end of the year 2010, more than 2.5 billion photos were uploaded daily. Facebook servers served nearly more than 1.2 billion photos per second in that year. Facebook photos so far were much better with its size and appearance than ever before in the year 2010. And the credit for this photo success goes to Divvyshot, whom Facebook acquired in April, 2010. Earlier by 2008-09, the size of a Facebook photo was staggered just at 604 pixels, and then FB introduced a bigger size of 720 pixels in March, 2010. That was an increase of 20% in the size. Then in July, 2010 came the advanced photo tagging options where tagging a friend or relative became much easier with some simple clicks even from the home page. 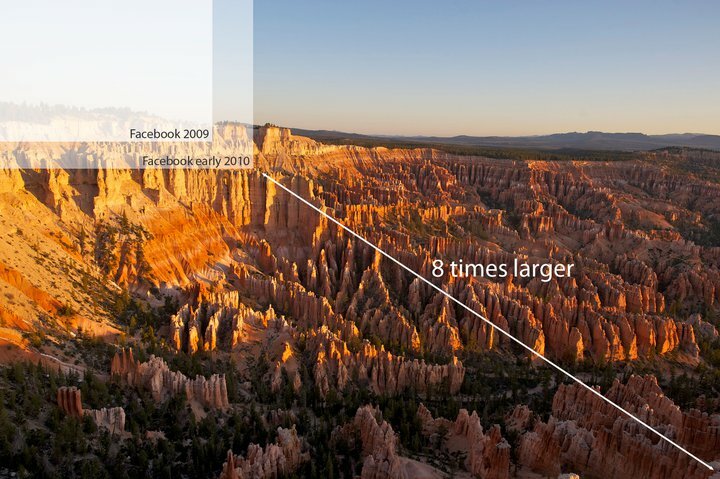 Pic: Facebook Photo Dimension Changes over time. In Dec, 2010 came the most controversial suggested photo tagging option. In Feb 2011, this size was further increased to a dimension of 2048 pixels on broader edges. Not to confuse that still Facebook photos were presented at a dimension of 720 pixels for standard viewing and by August 2011 this standard viewing size was increased to 960 pixels with a black background (the background was supposed to contrast the photo with a good look though it doesn’t). The introduction of background really suffered a good amount of criticism but is still there and can be experienced while viewing photos of smaller sizes. Of late, Facebook was testing 3 photo viewing platforms in Jan 2012 as per the reports from Inside Facebook. And as a result today we are experiencing this latest photo feature on FB. Facebook has always been through the process of change hooking up to two basic things – better user experience and higher Ad placement opportunities. The latest changes are no different. 1. With the latest Facebook photo move, one can experience a bigger photo with a viewing dimension larger than the earlier 960 pixels that was introduced in the month August in the year 2011. 2. All images are with a black(ish) background that can be experienced while viewing a small picture. Latest changes in Facebook photo platform is gonna impact the overall aspect of the entire Facebook experience an user might have. Yet, this is not something of a final presentation from Facebook, we are yet to experience many more changes in near future.